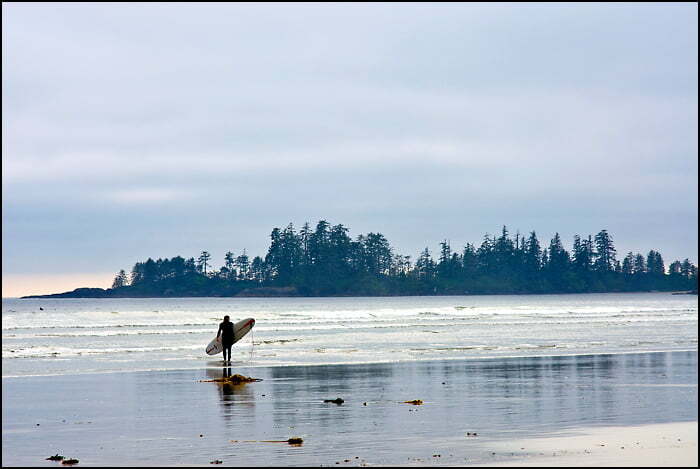 TOFINO, BRITISH COLUMBIA — I’ve always been an active traveller. I simply can’t spend all day lounging on the beach without succumbing to a life-long bout of hyperactivity. As such, I plan all of my trips around what I can actually do — whether it’s hiking in the Rocky Mountains or snorkelling in the Andaman Sea. My latest adventure, however, took these hyperactive travel tendencies to a whole new level. There is likely no more diverse recreational region in Canada than Vancouver Island. From world-class surfing, to championship golf, to unparalleled skiing and snowboarding, the land of milk and honey offers something for every active traveller. Recently, however, I wondered, is it possible to do all three, surf, golf and ski … in the same day? From blue-bird skies to a late-season blizzard, here’s what I found out. To get started I planned an easy route from Tofino, down through Qualicum Beach, and up to Mount Washington in the Comox Valley, a route I’ve begun affectionately referring to as god’s elbow. This is nothing more than a three-hour drive between the east and west coasts of Vancouver Island. The captivating coastal geography of these very distinct communities — from the snow-capped spires on Sutton Summit to the languid sand shores of Denman and Gabriola Islands — actually seems to have the drive end too soon. We started in Tofino on a particularly breathtaking and sunny April evening, with the clean west coast swell peeling into Incinerator Rock at a perfect six feet. Down the road, with surfers of all age, shape and sizes running, walking, and biking from the North Chesterman’s Beach parking lot to the foot of the breaking waves, a school of five-millimetre wetsuits, trying to take advantage of the last of the spectacular 7 o’clock sun, I couldn’t help but get excited. Although I wanted to get into the water myself I knew I had to save my energy for the following day when we would wake up and start the first leg of our surf, golf, and ski adventure with a lesson with Surf Sister. Also, we had a reservation at the world-class Wickaninnish Inn, which is literally a stone’s throw from this classic beach break, and I didn’t want to be late. I cannot imagine a better way to start an adventure, any adventure, than at the Wick. With all of my nervous energy about the next morning bubbling to the surface, the award-winning Relais & Chateaux boutique hotel and spa made every accommodation. The room was incredible, with handmade truffles and a perfect view of the surf waiting for us when we walked in. And although it offers among the finest dining experiences in the Pacific Northwest (and is home to one of the Top 50 Restaurants in Canada), the Wick puts aside all ostentation to craft an authentic, personalized experience for people of every culture and creed. Now I put myself through J-school many moons ago as a waiter in a fine-dining restaurant. And I normally love to roll through the inspired delicacies of the west coast in the hands of a world-class chef like The Pointe’s Nicholas Nutting. However, all that nervous energy was calling for, wait for it, a good old-fashioned surf bum cheeseburger. Avec frites. When I choked through a laugh to interrupt our most excellent waiter’s list of wines and charms to ask for a burger, I felt a few heads in the upscale eatery turn. But without flinching he responded with a resolute yes, followed by the perfect follow up: “Would you like bacon on that?” Luxury without pretense, the best kind. My wonderful wife eventually convinced me to try an intriguing vegetarian dish, telling me that if my appetite of nerves was still unsatiated she would have them send the sandwich with room service. I joked about it throughout the wine and exceptionally unique flavours of the local foliage, but let’s just say there was eventually no need. We sat and laughed and watched the sun go down, the ocean swell impossibly close to the restaurant’s windows, the exploding white water on the reefs in the distance fading into the night. It was incredible. But it is good to know that a place with a menu as refined as The Pointe’s will whip you up a burger if you ask. The next morning could not have been more beautiful. I was up with the first light and watched the tide change from the balcony in our room while sipping on strong coffee. At around 7 am I met a warm-spirited Brit in a bright yellow VW bug. She passed me an oversized wetsuit and shared stories with me about her days learning to surf off the coast of Wales. Within a few minutes she had me practicing my pop up on an imaginary board under the blue morning sky. Minutes after that we were bobbing up and down in the three-to-four-foot swell on Chesterman’s, revelling in the west coast. Now I am not much of a surfer, despite many years in the water. But there are few feelings I find more fulfilling than getting past the breakwater and bobbing in the swell and trying to harness the power of the ocean. Suspended there in the cold Pacific, soaking in the mountains, beach and the unthinkable ghostly cedar structures, including the Wick, strapped to the ragged rocks around Tofino, is definitely enough to bring anybody to life. That and the conversation and instruction of a guide seasoned in this surf. There is no more telling expression than the face of a person doing what they love to do. Not because it pays well, not for some sense of glory, and not because it makes any sense at all; just because it is a beautiful thing to do. And surfing in the Pacific on the Canadian west coast, as cold as it sounds, might just be one of the most beautiful things to do anywhere in the world. In the time my arms could take it, I can honestly say I learned more technically about surfing — basics I had never built from when I started thrashing around on my own many moons ago — than I ever had previously. But as nice as it was watching the sunrise over the coast from our spot on the water, as usual, I didn’t want to play too long in one place. It was time to head for a soak in a hot shower to shake out some of the salt water and lactic acid before making the two-hour drive down to Qualicum for my tee time. Read Part 2 of Miguel Strother’s attempt to surf, golf and ski in one day on Vancouver Island.